I've never understood how I managed to last 20 years of my life before doing my brows! My first ever brow product was the ELF Eyebrow Kit in Dark which I am still enjoying today. 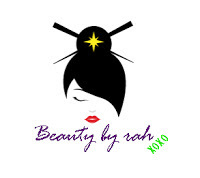 I've ventured into brow products the past few years and have tried pencils, gels and pomades. However, I rarely (if ever) use a brow powder as my previous experiences were not the best as they fade and disappear the moment I step out of the house. 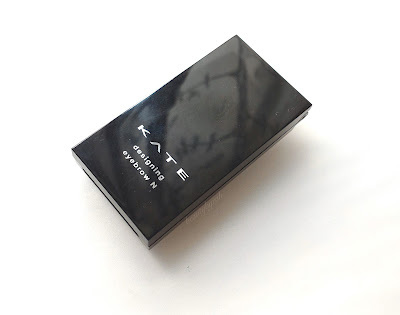 Recently, I had the chance to try out the Kate Tokyo Designing Eyebrow Palette. 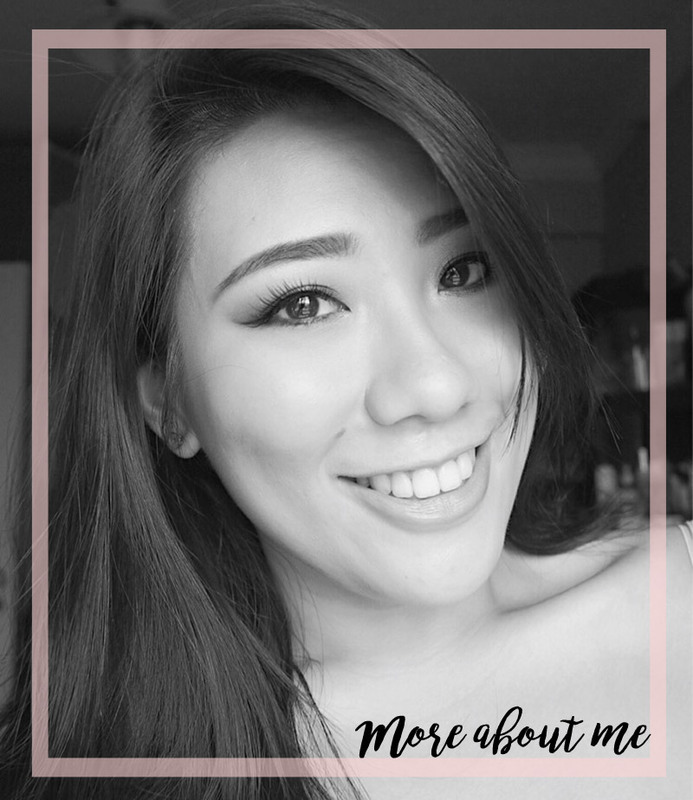 Let's start with my first impressions! Packaging was definitely a plus. 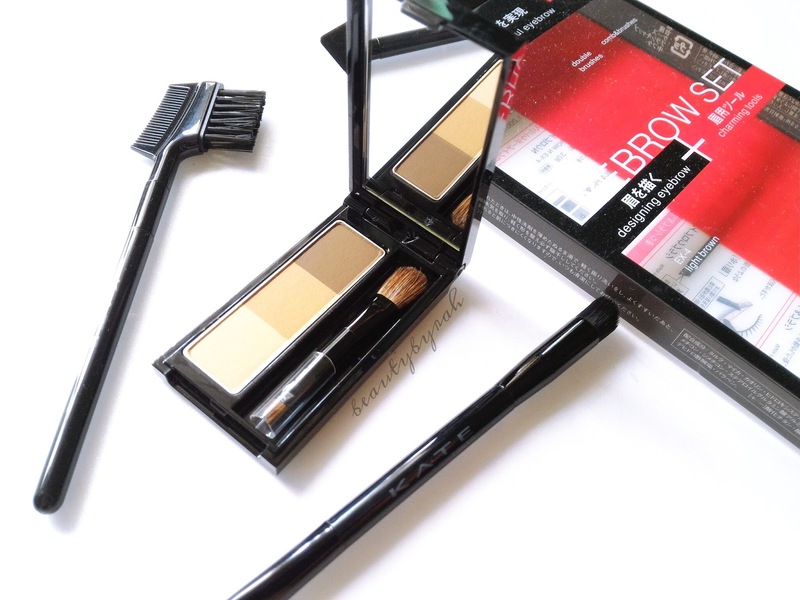 It is compact, small and slim - perfect brow set for travelling! 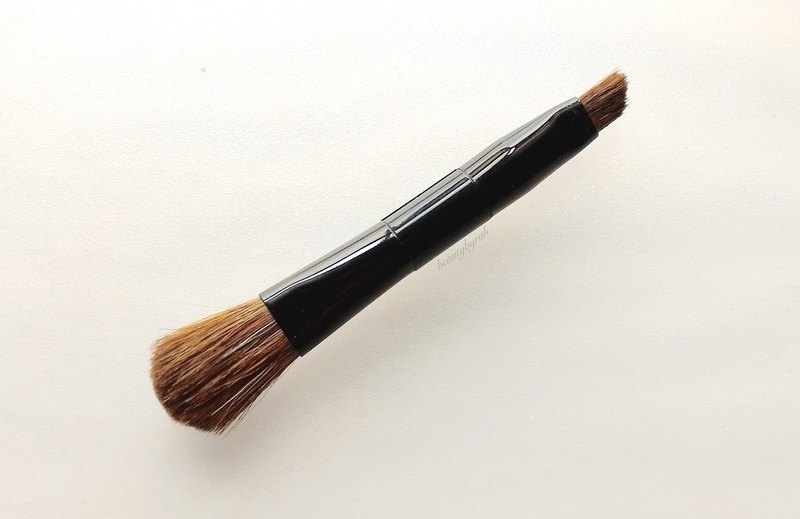 Inside the kit, there is a small dual-ended brush and a mirror. 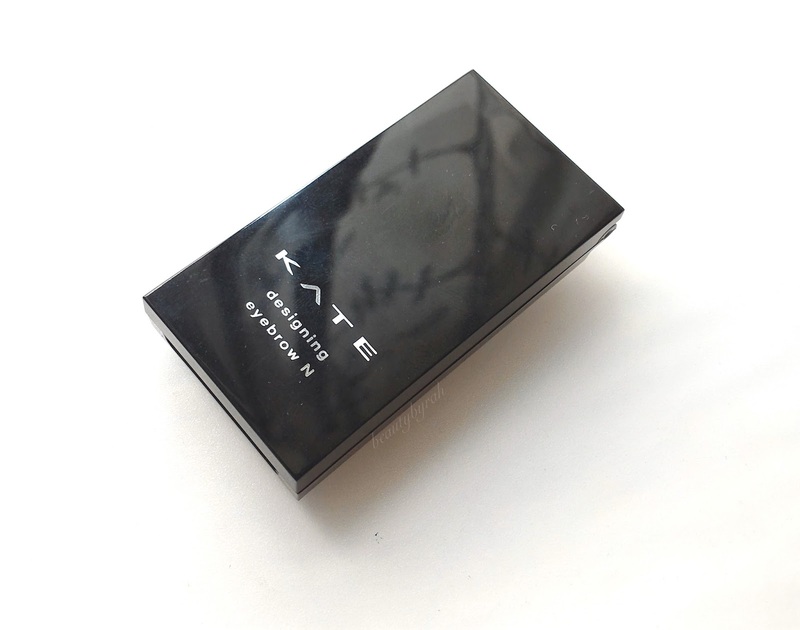 I like how light and compact it was, but this sure feels sturdy and can last a good toss and turn in your makeup bag! The dual-ended brush comes with an angled side (for the brows) and a fluffier bristled brush meant for contouring the nose. The powders come in 3 shades - ranging from a cool-toned light brown to a warm hazelnut and a deep, rich yet cool-toned dark brown. The lightest shade is meant for contouring the nose and it is of a powder consistency. 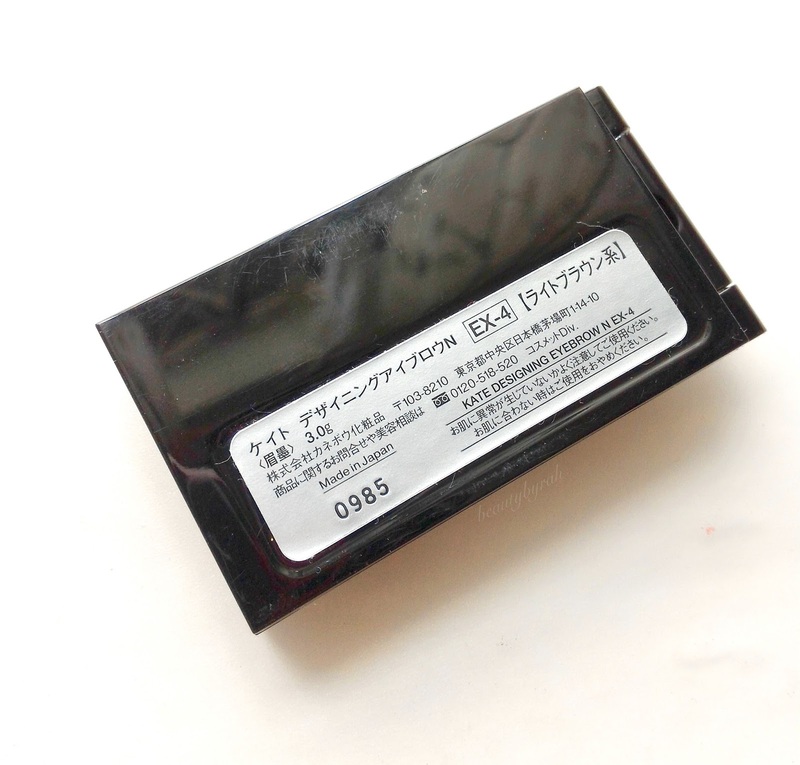 The powder is finely milled and the pigmentation is decent. However, I do not see myself using this shade on the brows as it is pretty light. In fact, when applied onto my skin, the colour blends right in and I'm only an NC25. 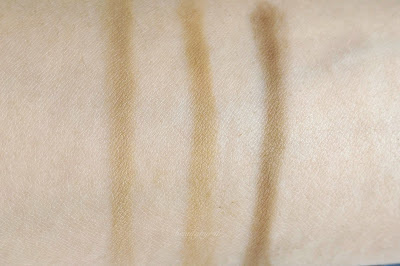 The shade in the middle is slight darker and warmer hazelnut brown. It is once again, a little light to be used on my brows for my preference. I can see my self using this as a transition shade in my crease and perhaps a little shading in the front of my brows if I'm ever feeling going natural. The last shade was promising, as it is a dark brown. It is still a tad too light for my taste as my hair is pretty dark and I'm fairly tanned. This would probably look best on those fairer beauties. Truth to be told, when watched with my finger, these powders seem to have a waxy consistency (despite it being a powder). Thus, pigmentation was close to negligible when done so. However, with a brush, the pigmentation is decent (but not intense). Thus, I feel that this eyebrow kit would be great for beginners as it is easy to handle without looking like you drew your brows in with a sharpie. I personally would not use this product alone as the shades are not suitable for my skin tone. I got my kit in EX-4 Light Brown. There is a EX-5 Brown available which would probably be more suitable. After experimenting, I found that my favourite way of using this product would be to set my brows after I have filled and shaped them in with a brow pencil. This step ain't entirely necessary though, as my brow pencil is pretty lasting by itself. Overall, I do feel that this kit would be great for beginners , people who enjoy a super natural brow and people who have perfectly shaped brows who just needs a little oomph and filling. If you're like me where days with a sharp and distinctive brow makes you feel complete, I'd say skip this one. This retails for $20.90 in local Watson and Sasa outlets.